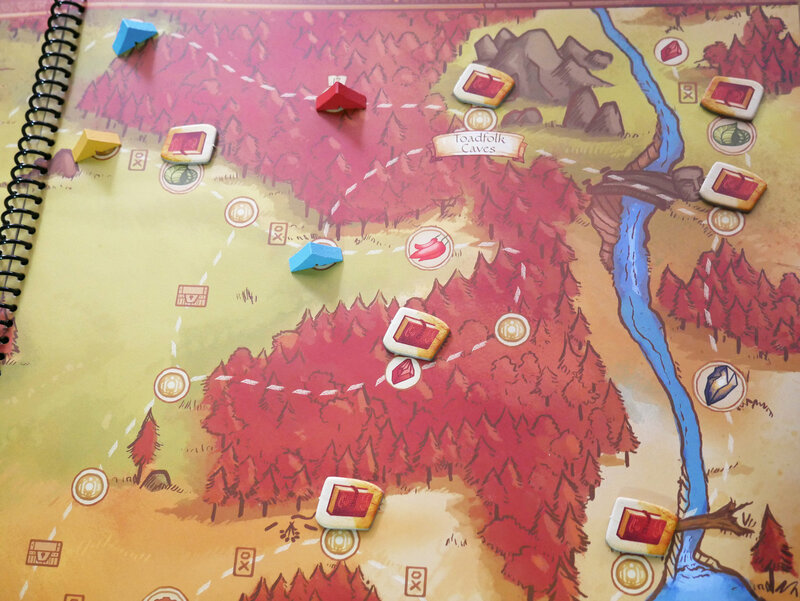 In Near and Far, 2-4 players are competing explorers roaming the land in search for the Last Ruins. To accomplish this, the players travel across several maps (and game sessions) hunting for treasure, discovering artifacts, setting up camps, and completing quests. There are two broad choices what to do on your turn: Stay in town to prepare or go out adventuring. You prepare by taking an action on the town spaces such as recruiting adventures (Saloon), collecting food/money (Farm/General Store), working the mine for precious metals (the Mine), getting a pack-kiwi (Stables), etc. Once you think you are properly outfitted for a journey, you head out into the wilds. The better you prepare, the further you can travel. Or maybe you want to just take a quick jaunt and return immediately into town. 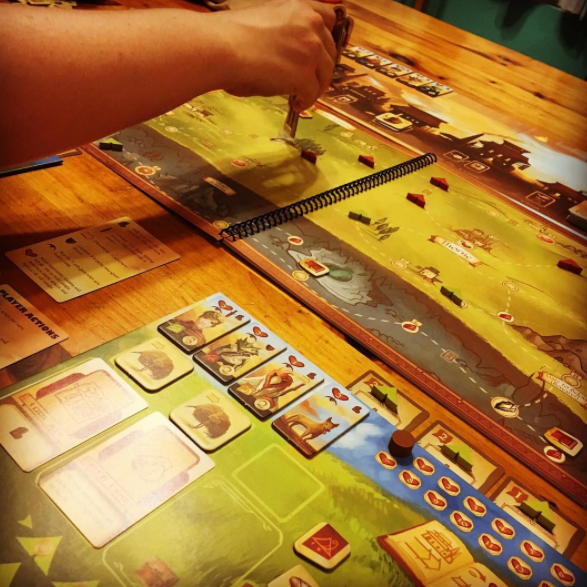 Will you focus on battling threats, courting the locals, discovering relics and treasure, completing trade routes, or quest-quest-questing until your little lizard heart’s content? Either way, Near and Far provides an experience that is worth delving into. 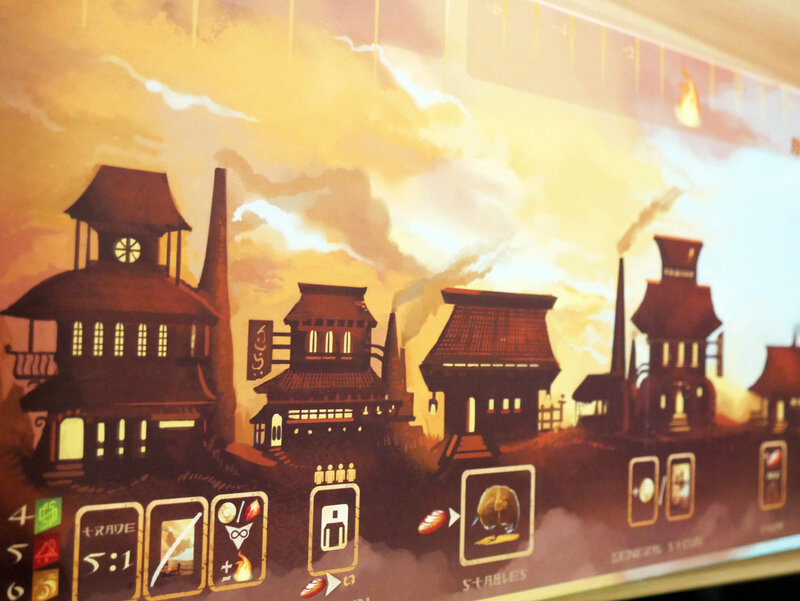 If you are familiar with Ryan Lauket’s earlier game, Above and Below, then you know that the spiciest part of this particular game will be the book of stories you read when questing. At the beginning of a game, several quest tokens are placed randomly on the map. When you arrive at one of these quest locations, a story is read from the book and you are given options on how you wish to proceed. 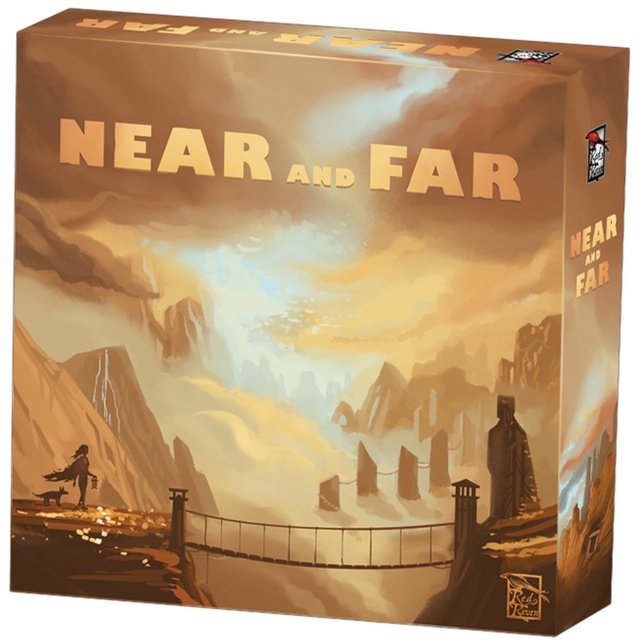 Through this choose your own adventure type mechanism, Near and Far does a far better job incorporating narrative into the game than in Above and Below. 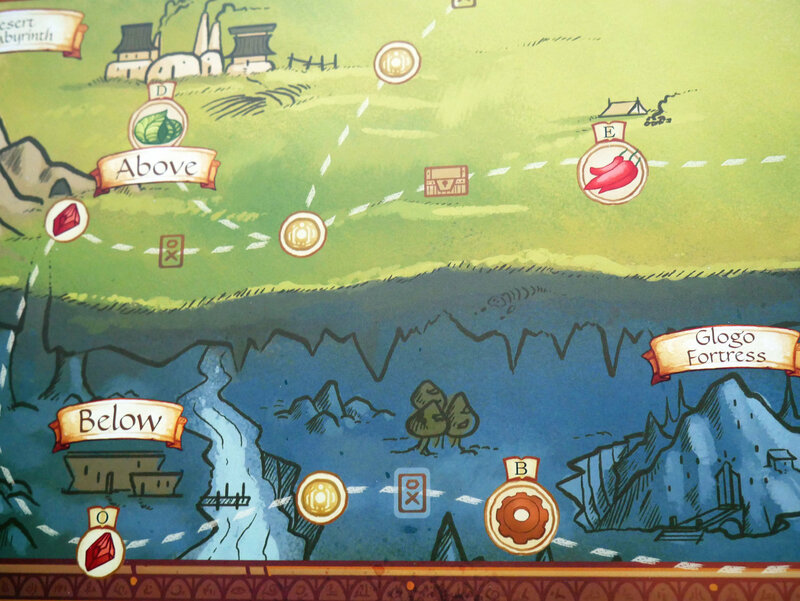 In Above and Below, the stories felt random and disconnected. While this gave some interesting diversions to an otherwise static eurogame, they didn’t provide much more than that. With the character and campaign modes in Near and Far plus a neat little keyword element, players can experience a much more cohesive narrative. It still isn’t the central point of the gameplay (you can play a game with very little storytelling) but it sure as hell feels like the keystone of the discovery experience. I think the team at Red Raven went the distance in providing a game that will appease a wide range of player needs. Arcade mode for those that prefer the gameplay over the narrative elements. Campaign and Character mode for those that want a more engrossing, immersive, and overarching experience and/or character development. The only thing lacking are options for solo or cooperative play (where, honestly, I think this game can shine). I’ve found myself silently wishing we were all somehow playing together rather than against each other. Luckily, you can find both fan-created variants online. Overall, Near and Far is a lot to digest and this review is far from comprehensive. After a few plays, I am anxious to play more but still prefer the city building aspects of Above and Below over the route building and exploration of Near and Far. However, I have not gone through the campaign mode yet and I fully expect that it will completely convert me. That said, the arcade mode removes the stories entirely and instead provides a small event deck for single map, non-campaign play which I think I will prefer in the long run. Another small issue is while Above and Below plays well for the entire player count, Near and Far is best and probably only recommended at two players. Three or four drags the game out too tong for a competitive game with too much down time between turns. If three players are taking long journeys and you are getting food at the farm, you are left with very little to do even with occasional quests. With two players, the gameplay is quick and snappy. 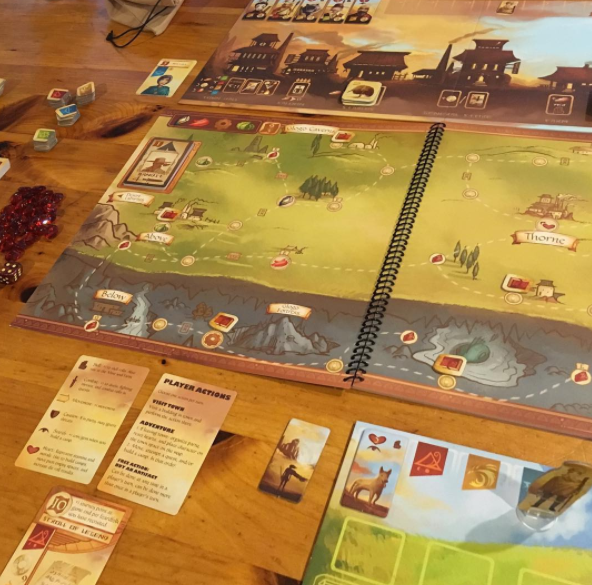 The narrative in Near and Far is engrossing, while Above and Below was disconnected and bordered on silly. I think the improvement in writing at team Red Raven is obvious. Additionally, the character design is a diverse, representative, and respectfully depicted. Armor and garb is appropriate and non-sexualized and it is obvious Ryan took time and effort in ensuring this game is welcoming and accessible to a wide-array of players.